This transcription was first published in Musicworks 71, along with score excerpts and photographs. Kalvos & Damian’s New Music Bazaar, Shows #118/119, 23 and 30 August 1997. Kalvos & Damian on the road in Toronto at the composer's home. Listen to the interview from the original broadcast: part 1 [0:33:24–1:59:47] / part 2 [0:29:23–1:07:05]. All seemed stereotypical, then, in our solid post-Victorian bed-and-breakfast surroundings — until she hooted a “Good grief!” at our formal introduction of “Ann Southam, one of Canada’s leading composers.” She then led us on a cliché-smashing tour through the career of a composer who’s wrestled with dozens of musical techniques and made them new again. [Kalvos] We’re very privileged to have you join us. Tell us your history, your story, how you wended your way through life as a composer. 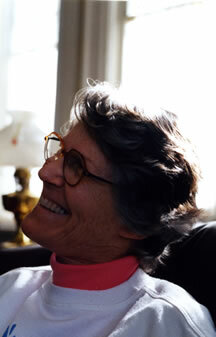 Ann Southam at home in Toronto during her interview with Kalvos and Damian. Photo © Kalvos & Damian. [Ann Southam] Oh good grief! That’s a massive question. [AS] I started thinking that I would compose music when I was about 15. Before that, I was going to be a visual artist. Then I switched over to music. It was more expressive, I thought, more emotionally expressive, and I was heavily into the Romantics, and heavily into imitating them. [Damian] Did you go through a Brucknerian period? [D] He was Canadian, you know. [AS] You could have fooled me! Don’t say things like that because I might believe you. I don’t know the difference. [K] Were you an imitative composer? [AS] Yes. I imitated my way for many years being very romantic, and then at some point I took up the study of music. I studied composition with Samuel Dolin at the Royal Conservatory of Music. And then I started fiddling about with the 12-tone system; that seemed like the thing to do. I’m not sure I fully understood what I was doing. I kind of faked my way along. And somewhere in there Sam Dolin got me into the electronic music studio at the Faculty of Music of U of T. Then things started to make some sense. [K] The lay listener might say the Romantic composer or maybe even the 12-tone composer makes sense. How does getting into the electronic studio suddenly make sense? [AS] One thing that I absolutely loved about that was that I didn’t have to be able to read music very well, which I can’t do, and I didn’t have to write anything down. You could work just by ear all the time. This was also in the early 60s, so electronic music was pretty much in its infancy, at least here in Toronto. So you could set your own rules. There weren’t these masters and ways of doing things hanging over your head. You could just go in there and have a wonderful time — which I did. There was no worry about whether you were writing something that could be played or not. You didn’t have to find people to play it and didn’t have to worry about whether it suited any instrument. It was just the sound. I loved that. Music was making some sense, and I felt I had some control. Then not too long after that I was connected up with a choreographer and dancer named Patricia Beattie, who had just founded the New Dance Group of Canada. So again I thought I’d died and gone to heaven. It just blew me away — the movement. So I had the opportunity to produce electroacoustic music for modern dance. The New Dance Group of Canada shortly became the Toronto Dance Theatre, which is now quite well known. I worked with them for a long time, and also other choreographers. I was doing this through the 60s and the 70s and into the 80s and life was making a lot of sense — and so was music. [K] You say you did electronic work and you loved that. But most of your recent work is not electronic. What happened? Did you move back? [AS] Yes I did. Just at the point where I started to do a lot of electroacoustic music, I had bought a very beautiful grand piano (which then just sat in my living room), which I never looked at or played. At one point, I noticed that it was there and thought I’d like to start playing it. Also at the same time I was starting to be aware of the minimalist movement. I heard A Rainbow in Curved Air which I absolutely loved, and other things by Terry Riley. I heard music by Steve Reich, and I truly loved it and still do. It’s certainly a very, very different way of working from messing around with electroacoustic sound. So I’ve been exploring that in recent years. Fluke Sound comes from 1989; perhaps the material was put together in 1986. It would reflect an interest in minimalist music because it just goes on and on and on with things being repeated and repeated. Nonetheless, there are these gestures, these punching sounds, which hearken from the old days. We paused to hear Boat, River, Moon and Fluke Sound [0:41:11–0:58:17]. According to Southam’s notes accompanying the recording, Boat, River, Moon was composed in 1972 at the Electronic Music Studios at the Royal Conservatory in Toronto, commissioned for a dance choreographed by David Earle of the Toronto Dance Theatre. It was premiered in September. She writes, “The general format of the music — divided into four sections — follows the narrative of the dance, but the rhythm within each of the sections, that is to say the change of flow of tension and energy in the sound, is not meant to parallel or duplicate the movement of the dancers, but rather to explore the drama of the dance in its own time. The dance itself is constructed in Noh Theatre form and presents the allegory that the three aspects of ourselves — the warrior (mind), the woman (senses), and the priest (spirit) — are at war with each other and where one is weakened, the whole is vulnerable and oblivion reclaims us.” The music was realized with two Putney synthesizers, additional sine-square oscillators, three two-channel tape recorders, and mixers. [AS] I should say that Boat, River, Moon was written for a dance, and Fluke Sound is music music. [D] Can you hum any of Fluke Sound? [AS] I can’t hum anything of any sort, so don’t ask. [D] Just curious if you went around humming tunes and then electroacoustalized them. [K] “Electroacoustalized.” Sounds like something you’d do with fresh ginger. [D] And hum that, as well. [AS] You’re nuking the sound. [K] Nuke the sound and then electroacoustalize it. Newcoustalize it and then move on to some of your pieces for acoustic instruments. Your piano music shows an astounding range. Do you love the piano? [AS] Yes, very much. I play it, sort of, not very well. I wish I could play it better. But I do love getting in there, the hands on, messing around. I like just touching something. Um, what was your question? [D] About humming your tunes. Do you hum when you play? [AS] I think I do. As a matter of fact, I become quite hoarse when I play the piano. I don’t know whether I’m trying to stop myself from singing or what. [AS] Yes. I can’t speak after I’ve played. [K] The Glenn Gould influence. Is your approach to writing for the piano a return to Romanticism? [AS] I’m returning to it now. I remember when I first heard Charles Ives’ Concord Sonata. What appealed to me was the massive physicality of it, and what it must be like to be able to play something like that — grabbing fistfuls of notes — and the immense complexity of it. And I just loved to imagine what it must be like being up to your elbows in these notes and sounds. I like that aspect of it. I also like Brahms’ piano music for the same reason. I like the chords, and I imagine what it must feel like playing them against one another. I’m inspired to imitate the physicality of these pieces rather than the musical organization. That would inspire a lot of the way in which I organize sound on a piano. This would be the pre-minimalist. There’s a duet called Four In Hand which I wrote some time in the 1980s which was inspired by the sheer fun of blasting about the keyboard rather than organizing the notes according to a minimalist process. [K] How do you go about writing? You said earlier that you weren’t a very good reader and you loved delving into the electronic sound because you could throw that aside. But now you return to writing it down. [AS] Yeah, that’s a problem. I just have to do it. I just do it. [K] Do you play through parts? [AS] I work it out at the piano, just what it feels like to have chords and notes and things in my hands, and what it feels like also to sit and listen to a sound or to what’s left. So I muck around — that’s the only way I can describe it — muck around with things like that. [K] Are you a performer? [K] Nor am I, and I’m always intrigued by the process of composing when you’re not a performer. Give us a poetic look at how Ann Southam creates a piece for piano. [AS] At some level I’m thinking about what it must be like to be sitting along with this person who’s playing the piano, and from what point of view would I be listening to this person? Is this person playing for me? When I watch dance, the dancers are dancing, in a sense, for me. I wish I could do it. Or figure skaters — I can’t think of anything I’d love to do more, but I can’t. Also it would be very hard. So I just kind of sit, and I’m with the person who’s playing the piano and I imagine what it must be like, what it must feel like to play. So that’s me on the audience side. [D] Would you consider writing a piano piece for a figure skater? [D] It’s not that far of a jump. [K] This is from the 80s. You’re making another transition now into a different kind of composing? [AS] I’m not sure. The minimalist music has been running along in other pieces as well as Four In Hand, in the form of a whole bunch of pieces I did called Glass Houses and Rivers, and they’re repeating patterns over and over with small changes and that kind of thing and the need to write down billions of notes. [K] How do you write? Do you work on paper? [AS] That’s right. For Glass Houses I devised a kind of shorthand, so really it only takes up two pages. I’m also trying to avoid having to write anything down, or to devise new and different ways of writing it down which might produce a different kind of music. I find that interesting. [K] What kind of ways would that be? [AS] I wrote a piece called Throughways for an ensemble of about fourteen instruments. But again there’s the problem of writing a piece — you have to write down all these notes for it, if it’s going to be a 10 or 15 minute piece, and all these instruments and all these notes. So sometimes you can devise a nifty way of improvising so you leave it all up to the players, devise a game they can play and a very succinct way of writing it down. [K] What does it look like on the page? [AS] I divided the ensemble into groups of instruments that vary. To start with, there’s a little circle with a pitch in it. Two instruments get to improvise for a minute using that pitch. I’ve also indicated that a capital letter means the improvisation is to be slow, mostly. If it’s a small letter, the improvisation is to be fast. And there are ways I can also indicate whether I want repeating figures or not. Then branching off down from the circle are two other pitches. The next group of players can choose either of those to make an improvisation. Following from that, there are other choices, and the next group of instruments can make a choice as to which pitch to feature and how to do the improvisation. So this is a 13-minute piece on one page. [K] How does someone coming along in the year 2132 understand how to do an improvisation based on your score? [AS] I’ve written out the instructions. Mind you, the instructions take up a whole bunch of pages. I hope that they’ll be understandable. But I suppose no matter what, if a group of players decides “let’s see what sense we can make out of this,” who’s to know what sense? It may not be what I had in mind, but they might come up with something. [K] The piece has an internal consistency, coherency, or logic that carries past the details of the improvisation? [AS] Yes. The way in which the piece works is clear throughout, in that all the improvisations are organized around a single pitch, and that pitch is to be featured. It’s the relationship among the pitches as the choices are made. It’s organized around pitches and choice and around the way in which one person’s choice is going to determine the choices available to the person coming next, or the group coming next. I like that idea. I think that’s clear. Now, of course, somebody just tuning in to the radio would not know that was the organization, so what they would get out of it? I think it’s clear that these pitches would be the organizing feature. [K] So the acoustic result is what matters to you as much as the process? Among the compositions of Ann Southam, Re-Tuning [1:26:53–1:35:40] is held in a special place by Kalvos & Damian, not only for its stunning performance by Rivka Golani on her CD Prouesse, but also for the scope of imagination condensed into just a few pages. The work uses a drone ground on tape, over which twenty-five recurring motifs are quickly overlain, producing a startling internal contrast: highly rhythmic clouds of sound. Typically, Southam hands the compliment off to her performer — typical of her respect and love for the people who play her work, and for whom she gives such latitude and responsibility. [K] Now there’s an energetic piece. [AS] That’s largely due to the player, Rivka Golani, who’s an absolutely mad performer, mad violist. This piece was originally called Tuning. It’s made up of tunes which are repeated over and over in a certain order, so this does not take up many pages of notes. I’ve got the tunes written on one page and then on another page I’ve got the order in which they are to be played. [K] It sure does sound like a lot of notes — it’s got stuff happening. [AS] I’ve just got the tunes written out and then an indication of how many times they’re to be played, so not all of the repeats are written out. The piece was called Tuning originally and each of the tunes was to be played four times, and it was to be played more slowly. Then Rivka Golani got her hands on it, and she thought that maybe the tune should be played only twice and that it should be played many times faster. It turns into a mad piece. I like the madness of it and the contrast between this mad playing and then the slow tunes. I can’t hear the tunes anymore. But for a person who’s not heard the piece ever, I don’t know what it’s like for them. [K] Is it a collaborative re-working? Did you spend time with the violist? [AS] We did spend some time, and she made some suggestions — the ponticello at the beginning and the way it ended. But she plays it differently each time. Sometimes she repeats things a lot more than I indicated. And there’s not a fixed relationship between the viola and the tape, so it varies a lot, I think, from performance to performance when she plays it. [K] You give up a lot of what’s considered the power of the composer to shape a piece. [AS] It’s hard to make decisions. Really, things can be played in many different ways and I don’t like to nail it down to one. So I very often don’t put in any dynamics or indicate voicing or anything, because, putting myself on the side of the player, I think that I would love to be allowed to work these things out for myself. [D] In this busy, workaday world, you have to give them more things to do? They just want to learn the music and get on with the next concert! [AS] Well, then, they’re out of luck! [K] You talk about the massive physicality of Ives and the Concord Sonata, and then we have this piece with the bells in it — a very delicate piece, Rivers. This is a different kind of physicality. How did this piece come about? What’s it about? [AS] It’s a minimalist piece, a process piece, in this case very slow. The repeating pattern in the right hand really is just two notes, back and forth, alternating, and around it is being woven a 12-tone row. It’s the same 12-tone row I’ve been using for the past 20 years. I’ve got this piece of paper which I keep getting out with this old row on it which I keep trying to rework, put to some use, beat some sort of tonal sense into it! So the process is to spin out the row one note at a time, adding a new note until the whole row is present. The two notes in the repeating right hand figure give a kind of tonal center around which the 12-tone row works. I like the intervals that are set up between the note of the row and the tonal center. I like the emotional quality of those changing intervals. Sometimes they suggest sort of a diatonic context, and you expect that’s its going to go in a certain direction — and it doesn’t. It all falls apart and goes off somewhere else. And this can be frustrating and you work to rationalize this. I like the changing emotional quality in these intervals that are set up as the piece goes along. [K] I was thinking that the bell-like description was very effective, not only because of the repeated notes, but because we hear a carillon. The harmonic content is so rich that the atonality of the bells is very much present, even though they are diatonic. Here is something that’s atonal on its arch that gives it a tonal fundament. [AS] There’s a slightly clangorous effect. There’s a set of these pieces, and when I originally wrote them, I was calling everything I wrote Rivers because I couldn’t think of anything else. And then this didn’t seem to be suitable when it got around to be recorded, so then I thought maybe Bells because it reminded me a little bit of bells. The name is uncertain, but Bells seems to work for now. An excerpt of Anne Southam’s Rivers, Set 2, The Bells No. 1 is played, the playlist is discussed [0:29:23–0:32:20]. [D] You have another recording, this one with Christina Petrowska. Did you ask her to play? [AS] Yes, I did. In the 1980s I hired her to make a demo tape of some of my piano music because there wasn’t a hope in hell of my ever playing it because there were so many notes. She did, and she kept two pieces in her repertoire: this Glass Houses, Number 5, and Rivers Number 8, Book 3. She plays both of those pieces and they’re both very fast. She has amazing fingers. [K] You once said you had two minds about using MIDI for keyboard music. What about your two minds? [AS] My two minds are about the technology, Midification, computerization, and everything. I’m opposed to the whole thing, just for fun. There’s something about it that bugs me. On the one hand, I’m sure it’s all great fun and thoroughly captivating, and on the other hand I refuse to do it. I would prefer to stay in touch with the actual instrument. In my mind, I have a picture. Here you have an instrument and you think of the beautiful body of the instrument, whether it’s a piano or violin or viola — all these conventional instruments. Over there you have a computer or synthesizer, which is basically just a box about which there is nothing appealing. So I would rather stay over here with this mechanical instrument, and have to exert myself, use my own energy to make it work. This is how I have it all organized in my mind and these are the differences that I see. It’s just a way of thinking that I’m enjoying at the moment. [K] It’s intriguing that you worked in electronics, and continue to work with electronics, such as the piece for viola and tape. [AS] All my equipment is thoroughly out of date. I don’t think it even works anymore. [K] So you’ve abandoned the electronic dimension completely? [AS] Yes. I went up as far as voltage-controlled synthesizers. The ones that I had were simple little Synthi AKS’s, they were British, in a briefcase. And I thought they could produce wonderful sounds. I was never at a loss. But they can’t be repaired anymore. So I just wondered “do I really want to do this?” I liked it when you really couldn’t nail things down much. There’s just nothing about a computer that appeals to me. [D] If it were more ornate, had filigree and maybe some lace curtains? [AS] No, because that would be like an attachment. It has nothing to do with the way the thing works, whereas the design of the piano and the way it looks has a lot to do with the way it sounds. The same is true of a violin. The sound and the body of the instrument are very much related. [D] I have lace curtains on my computer screen. It makes me feel much better. I look through them. [D] It is hard. I don’t see the corners of the screen anymore, but that’s something I’ve learned to live with. [AS] That’s a thought, hanging lace curtains in front of the whole thing might make it more appealing. [D] I use it as a dust cover, a dust ruffle, a tea caddie. [AS] I like that idea, putting a whole tea caddie over the whole thing. Well, there’s some hope here. [AS] No, no hope for you! We listened to Glass Houses [0:38:28–0:46:45]. It was vintage Southam, in that disconcerting way of renewing familiar forms and techniques. The 1981 composition uses brief musical modules that are tonal and rhythmic. In her notes, pianist Petrowska believes “it reveals a serene lyricism that is a common thread in Ms. Southam’s music.” And there it is. The common thread of renewing each form and technique is lyricism, contrasting with her stern and angular presence. When Schoenberg said there was much great music still to be written in C, he suggested a wider artistic aphorism: There is still great music to be written using techniques others have rendered effete and erstwhile. Southam’s lyricism — perhaps her fascination with an instrument’s body and resonance, its tone and sensuality — re-invents the musical art. [K] Talk about minimalist influence! [K] But you don’t notate every note here. In some ways you jump back to In C, which was modular. [AS] I thought that was an ingenious way of devising a piece. Part of the way the piece works is a result of the way it’s written. As you try to solve the problem of how to write something down, you’re producing a new form or a new kind of music. I like that. In C is a kind of game, and I think it works wonderfully well. I love that piece. [K] So Glass Houses has that pulse, pushes ahead, and is tonal. [AS] That’s right, and it’s only written out on two pages. [K] What are you writing now? [AS] I’m working on a piece for Eve Egoyan. Again it’s the same old 12-tone row. [D] Can you hum it? [AS] If I could hum, I could. I’m working it yet another way — a process again of spinning the row out note by note so that the phrases get longer and longer. I’m also exploring long periods of waiting. I really like what happens to the player, what happens to the listener when there’s nothing happening. What are you going to do with that time? How do you remember what you’ve just listened to? What else comes to bear on this time when nothing is happening? I do like the business of waiting. I’m exploring how you might set up periods of waiting in which nothing happens. Things are definitely happening. It’s just having to keep still and having to wait. That’s very hard to do. Patience — this is a whole lesson in patience. [D] Patience is not the first word that comes to mind. [AS] It isn’t? What does come to mind? What is the word? [D] Aggravation is right up there. [AS] And being infuriated, yes. [K] Well, speaking of infuriation, do you survive as a composer? [AS] No I don’t. I have an independent income, which makes life much easier. [K] You’re a prolific composer by all appearances. [AS] Prolific? What makes you say that? [AS] It’s just that I’m writing the same piece over and over. That’s why the numbers are so high. [K] How has it felt for you to be a composer all of these years? What are your gratifications? [AS] I’ve been very lucky. At the beginning of my career, I got connected up with modern dance. These people in the dance world were determined to make a place for themselves, and they worked very hard to get their companies established and to get performances going. I was in there as part of the crew providing music. So there was a market for the music. I would reach an audience through the association with dance. In that sense I was very lucky. I would be known in that way, so if I were to go to musicians and ask them to play a piece of music, they might already know who I was. I’ve been immensely lucky. I think that’s been an extremely fortunate collaboration in that we were all kind of starting off at the same time, with me and the electroacoustic stuff, and then the modern dance getting going and the two of us working together and being quite happy with what we had to offer each other. It was an absolutely wonderful collaboration and I’m thrilled to have been part of it. [D] I’d like to hear that 12-tone row one more time. [AS] If only I could sing it! I’m sorry I can’t. Rivers, Book 3, No. 8 is played to close the interview [0:56:50–1:07:05]. Kalvos & Damian’s New Music Bazaar was heard from 1995–2005 on WGDR FM 91.1, Goddard College (Plainfield VT). http://kalvos.org.